Backing fabric yardage – how big is your quilt and what amount of fabric do you need for the quilt back? I was just in the store the other day in fact purchasing the backing fabric yardage for a quilt top– a big one! Can you just imagine the happenings? oh I bet, you’ve been there before. A few of us were all huddled around the cut table with a few calculators in hand and working out the scenario. What if the seam was here. What if it went the long way. How wide is that bolt of fabric? How much do I really need? Are you sure that’s enough?! Had I only had the free printable on hand. What was I thinking trying to purchase that much fabric for the one purpose of a backing and not bringing it to help remind me what I needed!?! Backing fabric yardage is not easy! You’ll find it is tricky when quilts get a little bit larger and you have a seam. So, here is your helper. One that you can tuck away and is right there when you need it the most. This sheet will give you the size needed in yardage, lots of different quilt sizes are listed. 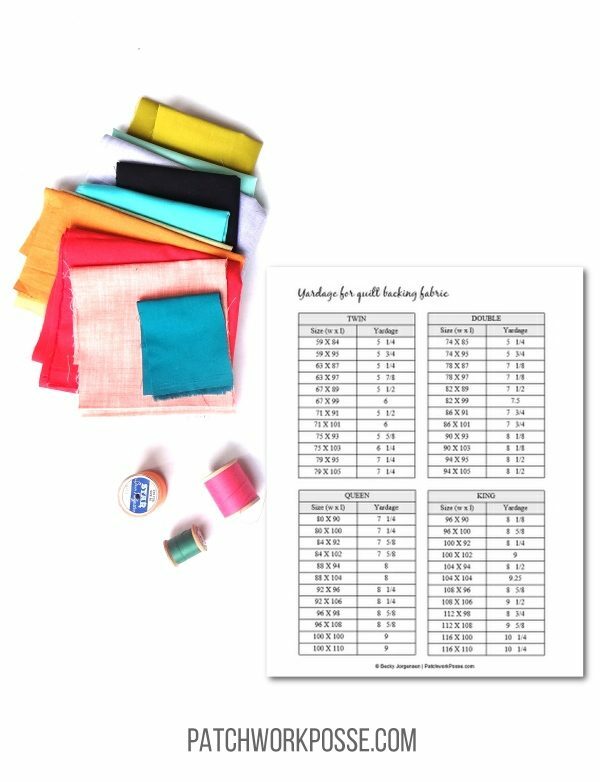 You can find the free printable in the pile of Quilters Cheat Sheets– grab your copy here! 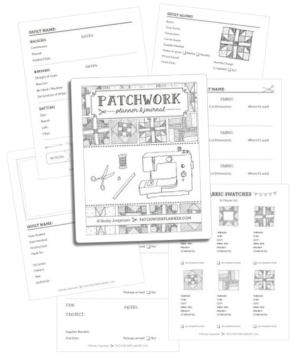 If you are looking for a full planner and journal that you can print what you’ll use and customize– check out the Patchwork Planner & Journal Bundle Pack! There are over 130 pages you can choose to use! *Includes two of my most popular planner & journal bundles: the Patchwork Planner & Journal and the 2 additional layout / designs and a bonus: Quilter Cheat Sheet. You CAN keep your projects under control and love that creative mess while finishing what you started. More time sewing, less time searching. This is a compilation of 3 planners, 1 quilters cheat sheets, and 2 mini collections. Everything you’ll need to organize your sewing projects, notions and build a resource library. Thank you for the printables ( from one Jorgensen to another)!